New! Modification of dry needling for plantar fasciitis procedure. We are not aware of any other clinic or facility that is providing this treatment other than our clinic at this time. One of our goals with dry needling has been to use the smallest dose of cortisone possible. This is because there is a small risk of rupture of the plantar fascia with any cortisone injection. The way that this risk has been reduced dramatically has been to inject between the plantar fascia and the fat pad (and avoid the plantar fascia itself). It is possible to do this procedure without using any cortisone at all. Some doctors have the theory that the use of cortisone with dry needling is counterproductive. This is because cortisone inherently decreases inflammation and the dry needling procedure itself is designed to actually allow for some inflammation and release of platelets with associated growth factor. With this in mind, we are starting to do this procedure for some individuals using platelet-rich plasmainstead of cortisone. The goal is to further augment the growth factor concentration after this procedure and allow the treated plantar fascia the maximum healing potential possible without adding cortisone which inherently decreases inflammation. This procedure is very similar to typical dry needling protocol. A local anesthetic is used. We again use our electrical nerve stimulation to help minimize discomfort from the local anesthetic. Then there is no discomfort whatsoever. 20 cc of blood is drawn from the patient and put in a two-stage centrifuge. 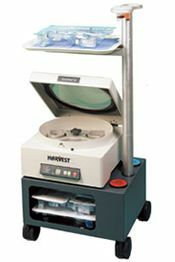 A high-speed centrifuge is able to separate out the component of blood that contains the platelets. So for the 20 cc of blood, we now have obtained 3 cc of platelets (with associated growth factor). This growth factor is then used instead of the cortisone. It is injected at the interface between the plantar fat pad in the plantar fascia. And we also inject some of this into the plantar fascia itself. There are several different local biotech companies that help with the preparation of the platelet rich plasma. They typically charge the patient a direct fee for this service that is not covered by insurance. However, the doctor’s procedure for the ultrasound-guided injection is typically covered by insurance. The post procedure protocol is essentially the same as typical dry needling. Some of the elements of this include the use of a cast boot and avoiding anti-inflammatory medication.